Do you have Fever? 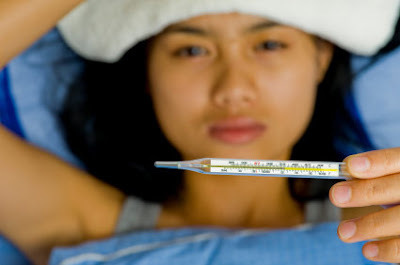 check out Top 10 Home Remedies for Fever. When any bacterial or virus attacks our body then our body itself tries to kill him. With this goal when the body temperature (98.3* Fahrenheit more than normal) increases then it is called as fever. However, fever may occurs due to fatigue or change in weather. There is no need of medicine in 100 degree fever. But if fever stays for 4-5 days in this range then you should take medicine. Many times fever reach to the 104-105 Fahrenheit. But today we’re going to tell you some measure which will be beneficial to reduce high fever. 1. Take ½ cup vinegar with warm water and take shower from it. 2. Take Vajrangi leaves and boil it in water. You must have to eat the bottom part of it. 3. Boil 4-5 basil leaves in one cup of water. Let it be cool and drink 3-4 times in a day. The second you will get relief in fever. You can use peppermint, elderflower and yero for sweat. 4. Take one piece of raw onion. Tie it up in warm cloth and rub it on your feet. 5. Take warm water in one bowl and mixed little vinegar. Place the strips of water on the head. It will reduce the high fever. 6. Take one teaspoon mustard seeds and soak it in one cup of hot water. Leave it for 5 minutes and drink it afterwards. 7. Make thin slices of potatoes and soak them in vinegar. Place these slices on the forehead and put cloth strip on it. 8. Place the lemon slices in the soles of the feet. Then cover it with wet cotton socks. In addition, soak the cloth in egg white and put it on soles of the feet and cover it with socks. 9. Take two teaspoon of olive oil and heat it with garlic paste. Place this mixture on the sole of feet and cover it with plastic. Leave it for overnight. 10. Take 25 raisins and grind it into the water. Filter this water. Mix the half lemon juice and drink twice a day. Also Read What and which type of food helps in Fever Recovery.